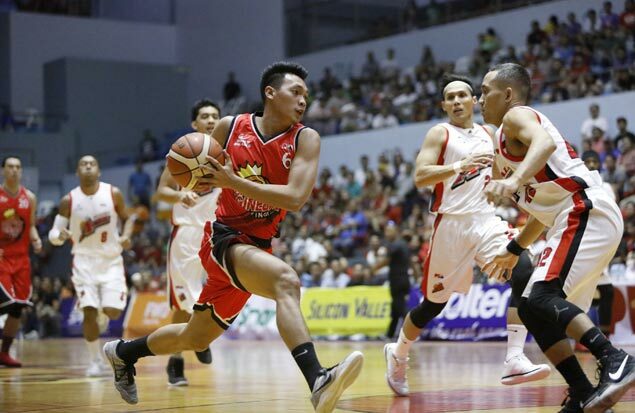 BARANGAY Ginebra spoiled the homecoming of Alaska’s Cebuano pride, adding to the misery of the Aces with a 94-80 decision in their PBA Governors’ Cup matchup on Saturday night at the Hoops Dome in Lapu-Lapu City, Cebu. The Gin Kings showed little signs of rust from a three-week layoff as they built an early lead that they maintained throughout the game, before weathering a last stand by the Aces, who paid tribute to Dondon Hontiveros at the half. Justin Brownlee led the balanced attack with 22 points, 10 boards, five assists, and three blocks, capping another all-around performance with a coast-to-coast slam that gave the Gin Kings a 92-80 lead and proved to be the exclamation point. As a result, the Gin Kings stretched their win streak to four games after starting the conference with a loss as they dealt the Aces their 14th successive setback after the Petron Saturday Special. Joe Devance again proved to be steady presence for the Gin Kings, finishing with 19 points, three boards, three assists, and three steals, while Scottie Thompson came just two points shy of a triple-double, scattering 11 boards and 10 assists in less than 30 minutes of play. Japeth Aguilar added 15 points, 11 rebounds, and three blocks off the bench, while frontcourt partner Greg Slaughter also registered a double-double with 12 points and 13 caroms, along with two blocks in almost 36 minutes as a starter. LA Tenorio was the fifth Ginebra player who scored in double digits with 12 points that came with six assists, four rebounds, and two steals. Calvin Abueva provided his trademark energy and hustle in his first game back from national duty, putting up 22 points, 13 rebounds, two assists, and two steals in a losing effort as import Buck Henton could only contribute 10 points on 4-of-16 shooting in almost 43 minutes. Hontiveros gained a rare starting gig and finished with three points, three boards, one assist, and one steal in 23 minutes. Trailing by 16 points, 84-68, with a little less than five minutes to go, the Aces made a last push as they came to within 11 points, 87-78, following Sonny Thoss hook shot nearing the two-minute mark of the payoff period.